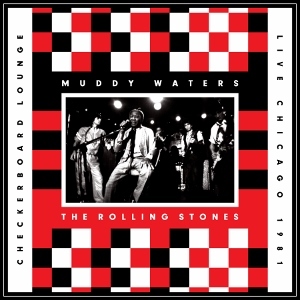 A few years back, we told you about the Live at the Checkerboard Lounge Chicago DVD that captured a historic 1981 performance from blues great Muddy Waters at Buddy Guy‘s Chicago club, during which Waters was joined onstage by the Rolling Stones, Guy, Junior Wells, and Lefty Dizz. If you didn’t take our advice then and pony up a few extra bucks for the deluxe edition of this now award-winning film that also included a CD of the evening’s performances, Eagle Rock Entertainment is kindly offering a second chance to own the audio from the program with its release of a standalone CD. Similar to the companion CD that was available in 2012, this one includes all of the songs from the DVD except for two, a “Country Boy” from Waters that took place early in the program (prior to the Stones’ arrival) and an instrumental reprise of “Baby Please Don’t Go” from Dizz. While it’s nice to hear the complete set of tracks and be able to fully witness everything that takes place through the DVD, this recording is much too good to pass up also having in your collection, regardless of whether you have already seen or own the DVD version. The program starts on a delightful song and a half — a crawling “You Don’t Have to Go” and the shuffling “Baby Please Don’t Go” — from Muddy and his band, allowing us a nice listen to Muddy and his colleagues on guitar, piano (Lovie Lee), and harmonica (George “Mojo” Buford) before Waters calls the Stones to stage one at a time, beginning with Mick Jagger. While one of the highlights of the film is of course being able to see the interaction between the players, you still get a fair enough sense of that here, including, for example, Waters and Jagger playfully trading vocals on songs like “Hoochie Coochie Man” (Jagger: “On the seventh hour…” Waters: “What?” Jagger: “…of the seventh day…” Waters: “What happened?” Jagger: “…On the seventh month, the seven doctors say…” Waters: “No kidding?” Jagger: “I was born for good luck…” Waters: “I see that” Jagger: “…and that you see, I got 700 dollars, so don’t you mess with me”) and “Mannish Boy”, which also adds Guy, Wells, and Dizz to the vocal mix by the song’s conclusion, at which point Waters can be heard commenting “Thank you very much for that song, a very good song”, and Waters band guitarist John Primer, Stones guitarists Keith Richards and Ronnie Wood, Guy, and Dizz trading licks through a Wells-led “Got My Mojo Workin'”, “Next Time You See Me” featuring both Guy and Wells on vocals, Lefty’s “One Eyed Woman”, and a “Clouds in My Heart” on which Waters returns to the stage, before the night closes with a little “Champagne & Reefer”. Together, it makes for a remarkably entertaining and star-studded set of blues that everyone should own. Go out and, as Muddy says at the start of the program, “do it… now”! This entry was posted in Albums and tagged Buddy Guy, George Mojo Buford, John Primer, Junior Wells, Lefty Dizz, Lovie Lee, Muddy Waters, Rolling Stones. Bookmark the permalink.